Allow Petty Cash Taqueria to reintroduce itself. It’s conveying Walter Manzke’s uni guacamole and pig-ear nachos to an impressive new Downtown space tonight. Look here before you leap. Nice, right? You’ll notice it’s bigger. Probably better. Most definitely hung with more hubcaps and Aztec-y hieroglyphs and pictures of Tom Petty being Tom Petty and Johnny Cash covered in birthday cake. You tend to notice those things. Next time you touch base with an Arts District–area date, you’ll start at the vivacious bar on the ground level. 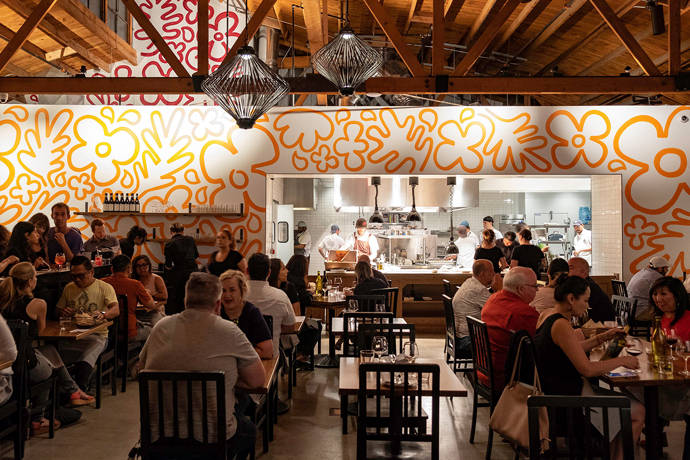 Tables above and around you will fill with tacos of wood-grilled octopus, nachos of the crispy-pig-ear kind and that uni guacamole—omens of things to come, once you finish your Rosé José (rosé, tequila, rhubarb, pink peppercorn, lemon and seltzer). It rhymes. Once your party has assembled, it’s patio time. This one’s more of a spectacularly massive, red-brick-lined outdoor arcade that will remind you of having dinner somewhere exceptional in Europe. But let’s agree to just call it a patio.